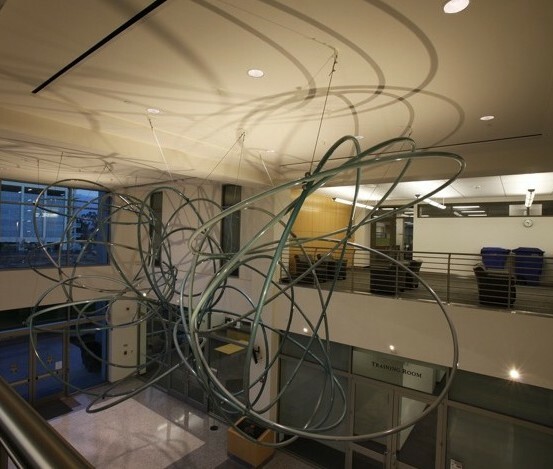 Orbital Loops, metal sculpture, commissioned by the County of San Diego CA for The County Operations Center, 2010-2012. 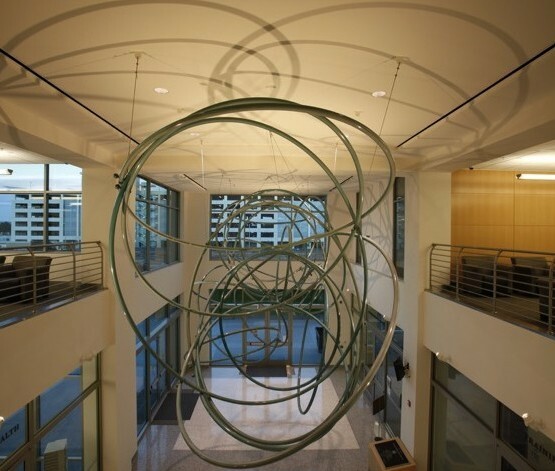 Orbital Loops, metal sculpture, commissioned by the County of San Diego for The County Operations Center, 2010-2012. Orbital Loops, metal sculpture, County Operation’s Center, commissioned by the County of San Diego, San Diego CA, 2010-2012. Orbital Loops, installation view, County Operation’s Center, commissioned by the County of San Diego, San Diego CA, 2010-2012. Joyce Cutler-Shaw’s sources of inspiration are the natural world, the human life cycle, and the mysteries of the cosmos. The idea for Orbital Loops was generated from her interest in the visual traces of the orbits of the spacecraft, Cassini, which used the gravity of Titan, one of Saturn’s 53 named moons, to propel itself into Titan’s orbit to trace the paths of planet’s rings and moons. It is a drawing in space that Orbital Loops depicts. There are many orbits — our solitary moon around the earth, the planets of our solar system around the sun, migratory paths of birds, flight patterns of aircraft around the globe, and Olympic athletes around their tracks. Orbits are inherent in our common origins and significant in the routine pathways of our daily lives.